The #1 New York Times bestseller and subject of the acclaimed major motion picture Bridge of Spies directed by Steven Spielberg, starring Tom Hanks as James B. Donovan. Originally published in 1964, this is the “enthralling…truly remarkable” (The New York Times Book Review) insider account of the Cold War spy exchange—with a new foreword by Jason Matthews, New York Times bestselling author of Red Sparrow and Palace of Treason. In the early morning of February 10, 1962, James B. Donovan began his walk toward the center of the Glienicke Bridge, the famous “Bridge of Spies” which then linked West Berlin to East. With him, walked Rudolf Ivanovich Abel, master spy and for years the chief of Soviet espionage in the United States. Approaching them from the other side, under equally heavy guard, was Francis Gary Powers, the American U-2 spy plane pilot famously shot down by the Soviets, whose exchange for Abel Donovan had negotiated. These were the strangers on a bridge, men of East and West, representatives of two opposed worlds meeting in a moment of high drama. No one was better equipped to tell the whole absorbing history than James B. Donovan, who was appointed to defend one of his country’s enemies and did so with scrupulous skill. In Strangers on a Bridge, the lead prosecutor in the Nuremburg Trials offers a clear-eyed and fast-paced memoir that is part procedural drama, part dark character study and reads like a noirish espionage thriller. From the first interview with Abel to the exchange on the bridge in Berlin—and featuring unseen photographs of Donovan and Abel as well as trial notes and sketches drawn from Abel’s prison cell—here is an important historical narrative that is “as fascinating as it is exciting” (The Houston Chronicle). Born in New York City in 1916, James B. Donovan graduated from Fordham University and Harvard Law School. A commander in the Navy during World War II, he became general counsel of the Office of Strategic Services and was associate prosecutor at the principal Nuremberg trial. Mr. Donovan subsequently acted as chief counsel in major trials and appeals in over thirty states, and was an insurance lawyer and partner at Watters and Donovan. He was Democratic candidate for United States Senator from New York in 1962; served as general counsel for the Cuban Families Committee, obtaining the release of more than 9,700 Cubans and Americans from Castro’s Cuba; was president of Pratt Institute; and was president of the Board of Education of the City of New York. He died in 1970, and was survived by his wife and four children. "Unique in the strange history of the Iron Curtain... Enthralling... A truly remarkable account of how the author fulfilled his stewardship as a lawyer and as a negotiator. He has done us a real service in writing this engrossing and forthright book." "Absorbing... A top-notch spy thriller." "As fascinating as it is exciting." "Strangers on a Bridge guides us through the saga with a dry and courtly wisdom." "As compelling as The Spy Who Came In From the Cold--except it happens to be true." "An impressive story of devotion to justice and the national interest." 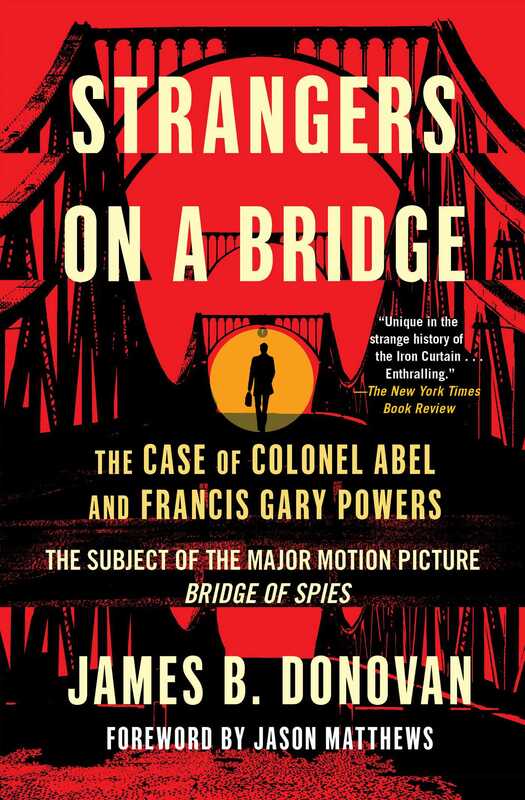 "Well written and informative, Strangers on a Bridge is a wonderful firsthand account of the most notable spy swap made during the height of the Cold War. Written by defense attorney James Donovan in 1963, the book gives an accurate overview of the behind the scenes negotiations that resulted in KGB Colonel Rudolph Abel being exchange for my father, CIA U-2 pilot Francis Gary Powers, in February 1962 on the Bridge of Spies."